Jeffrey L. Kurtz | Software solutions. Business development. Bill of Lading Analysis – Taking three years of MassDEP data, I analyzed where waste was being sent for processing or disposal. What’s the trend??? A greater proportion of waste is being sent outside Massachusetts. 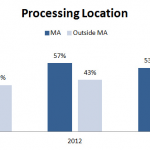 Waste Processing Locations in New England – Pulled from the Bill of Lading data, I mapped the locations of processing facilities and showed their frequency of shipments. 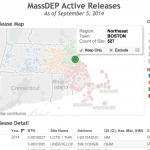 Release Site Visualization – The MassDEP publishes up-to-date information about chemical and hazardous material releases into the environment. I took that data and produced an interactive dashboard. Do you have PDFs with unstructured, non-tabular data that you’d like to import into a database? With a few graphical annotations on a sample document, my software can extract that data to a database or an Excel file. Please contact me for more information. I can help you with your custom software development needs. Whether you’re looking to automate a tedious task or improve the effectiveness of your team, I can help you reach your objective. I value cooperation and openness and strive to deliver what my clients need to improve their effectiveness.